I've had a bit of a tracksuit and hoody kind of week this week, hence no outfit posts but I went all out today!! As you can see from the photos, I troweled on the makeup, put a pretty dress on and straightened the locks. I instantly had a better day today as well. It's mad how as soon as I put some effort into my appearance I feel instantly better and more positive about everything. I've had this dress for a while and I've been meaning to wear it but I kept putting it off. I saw it hanging in the wardrobe and I knew today was the day to whack it out. It's from Very and, although the fabric is utter shite, I like the print, style and length on me. It's that kind of tacky material that if you went near a naked flame you'd instantly go up in smoke. 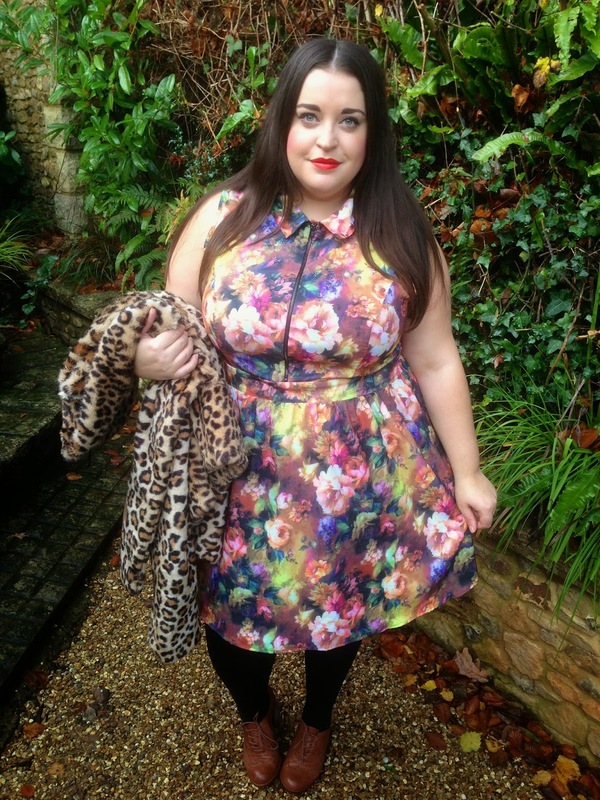 I love the autumnal, digital floral print and the zip running down the front of it. 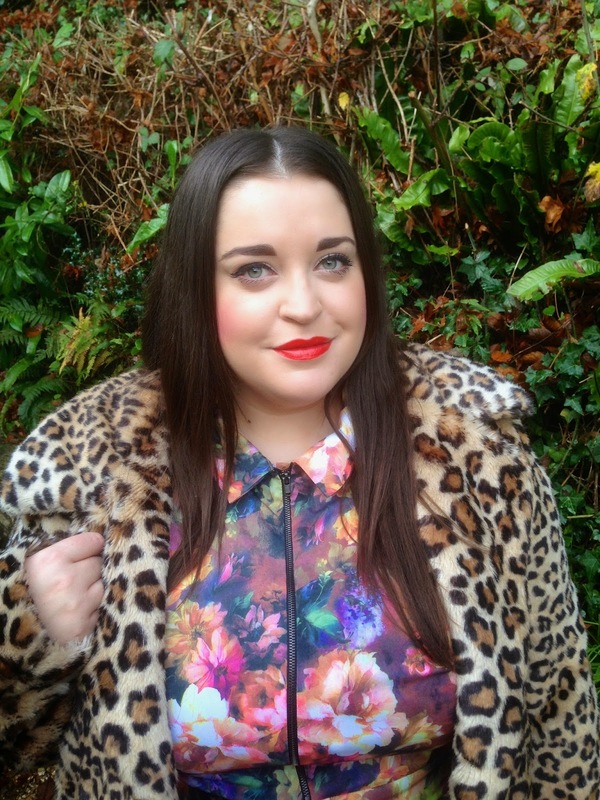 I thought I'd mix it with my leopard print coat. Pretty full on, but I'm no wall flower so we cool. This dress goes up to a UK24 and I got my usual size but I'd say it comes up pretty big, especially in the bust area so if you are a 26 I reckon you could get into it. I'm wearing a new lippy today, it's Rouge Buzz from Bourjois and I love the tangerine colour. It's a nice rich glossy lipstick and although I'm not wearing it with a lip liner, it hasn't bled which is good. I think I will take a look at the other colours in the collection when I am next in Boots. 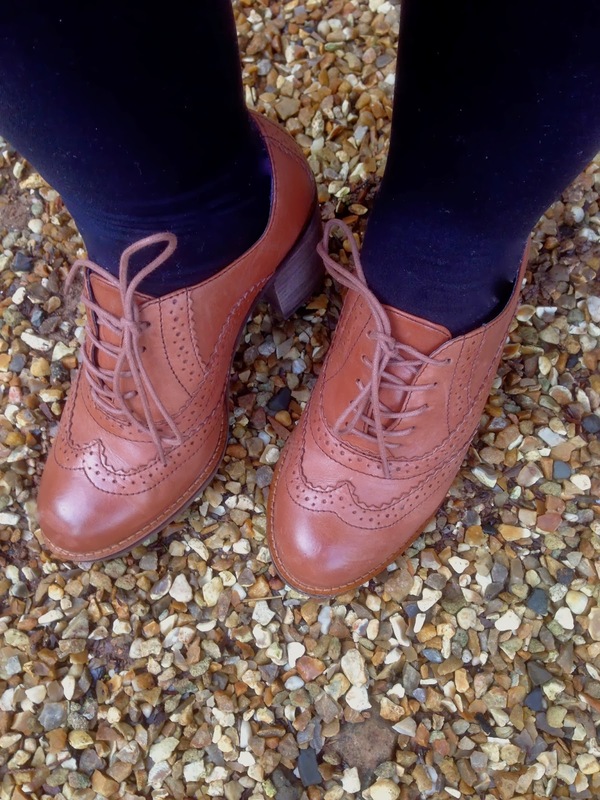 I've had these brogues for a lonngg time but they are from Clarks and super comfy! 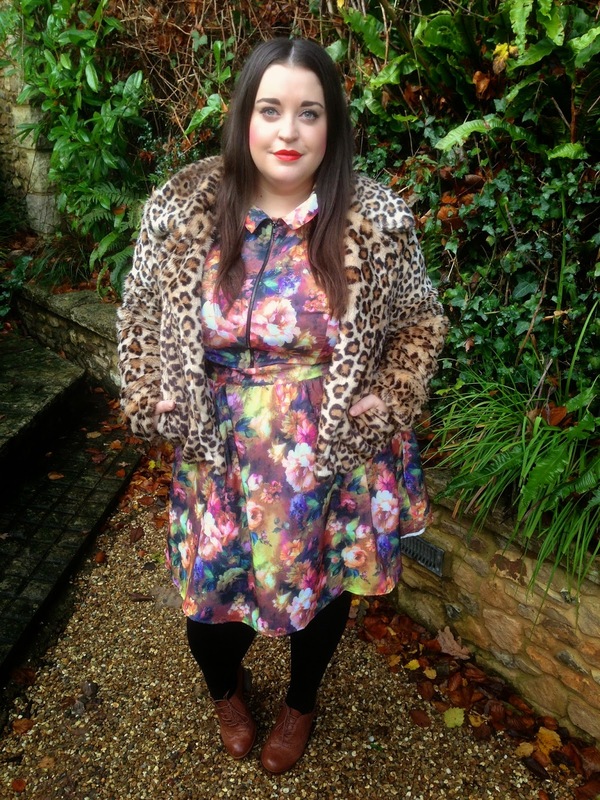 What do you think to wearing this much colour in winter? Do you prefer an all black ensemble or do you go for it like I have in this outfit? The dress is gorgeous! That's too bad that it's crappy quality, but it looks amazing, and I love how it goes with your leopard coat. I love the dress! Since you said the material isn't great I think I will have a butchers for other places they might sell something similar! I love your shoes too! Thank you! They are cool arent they! Very comfy. I love everything about this outfit! The more colors and prints, the better!